A polyhedron has vertices. The greatest distance between vertices is 1. What is the maximum volume of the polyhedron? This is known as the biggest little polyhedron problem. For four vertices, the solution is trivially the regular tetrahedron. Five vertices require an equilateral triangle and a perpendicular unit line; this was solved in 1976 . Six vertices require a more complex solution, which was solved to four digits of accuracy in 2003 [2, 3]. The author found exact solutions for 6, 7, 8, 9, 10, 11, and 16 points [4, 5]. This Demonstration contains those solutions, as well as the best known solutions up to 128 points. Oleg Vlasii improved many of these values. 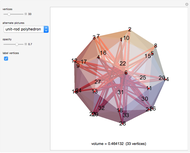 The unit-rod polyhedron shows a rod between all vertex pairs a unit distance apart. 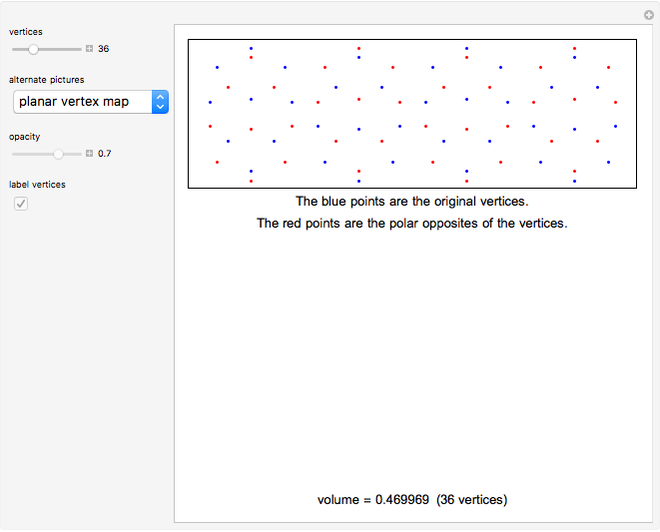 The unit-star picture builds polygons from half-unit rods meeting at a vertex. 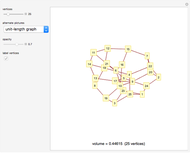 The unit-length graph shows how vertices a unit distance apart are connected. The planar vertex map puts the vertices on a sphere, then unrolls the sphere into a planar form. In the supported triangles image, all vertices of a blue triangle (with brown number) are at distance 1 from an opposing vertex with a matching green number. The Initialization section contains various programs that may be able to improve some of the solutions. B. Kind and P. Kleinschmidt, "On the Maximal Volume of Convex Bodies with Few Vertices," Journal of Combinatorial Theory, Series A, 21(1) 1976 pp. 124–128. doi:10.1016/0097-3165(76)90056-X. A. Klein and M. Wessler, "The Largest Small -dimensional Polytope with Vertices," Journal of Combinatorial Theory, Series A, 102(2), 2003 pp. 401–409. doi:10.1016/S0097-3165(03)00054-2. A. Klein and M. Wessler, "A Correction to 'The Largest Small -dimensional Polytope with Vertices,'" Journal of Combinatorial Theory, Series A, 112(1), 2005 pp. 173–174. doi:10.1016/j.jcta.2005.06.001. 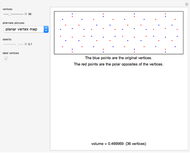 E. Pegg Jr. "Biggest Little Polyhedra" from Wolfram Community—A Wolfram Web Resource. (Oct 28, 2015) community.wolfram.com/groups/-/m/t/463699. E. Pegg Jr. "Biggest Little Polyhedron—New Solutions in Combinatorial Geometry" from Wolfram Blog—A Wolfram Web Resource. 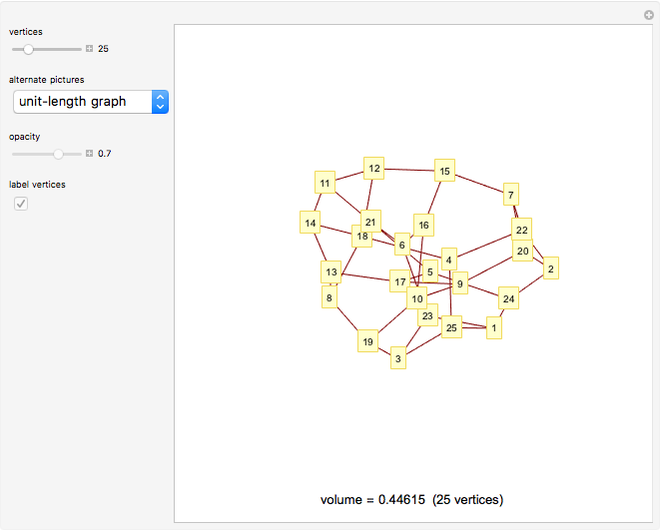 (May 20, 2015) blog.wolfram.com/2015/05/20/biggest-little-polyhedronnew-solutions-in-combinatorial-geometry. Ed Pegg Jr "Biggest Little Polyhedron"